a Visual artist born and live in Nazareth city. studied fine arts in Nazareth art college. 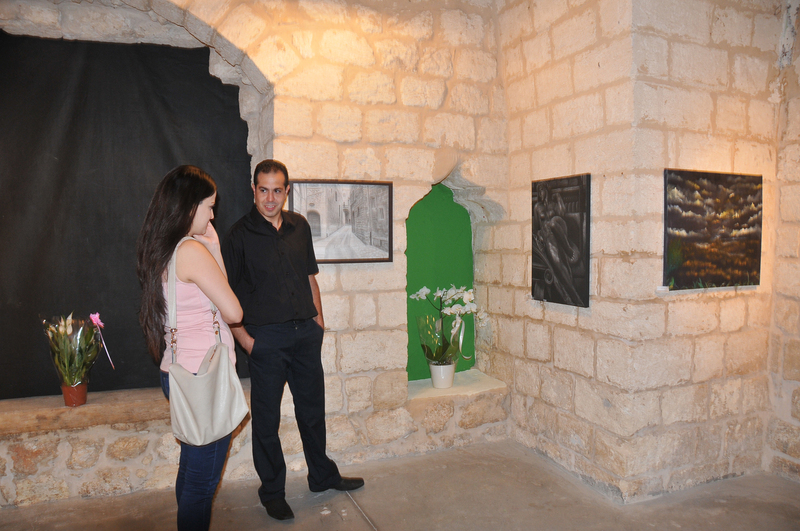 his first solo exhibition was exposed in 2011 in Nazareth cultural center. since then he had participate in other exhibitions jointly independent artists and foundations. Elias is the founder, curator of NazArt gallery and art studio and also a Management member of Elsebat association and Museum for preservation Palestinian heritage in Nazareth. Elias also a member of the Nazareth Arts Society and a member of the Committee for holding exhibitions and educational and publicity committee in the Assembly. starting his own career as an independent artist in 2007 searching for his own unique language in art he starts his first series of charcoal drawings “Palettes From Memory” the series which hold a charcoal urban view of Nazareth city and had exposed in Nazareth cultural center. after this he had an expertise with impressionism nature and landscapes paintings using oil colors 2010-2015, a figures drawings with pastels and charcoal to creating an abstract series in 2015-2016.
finally using a unique techniques as combination between charcoals with oils, acrylics or pastels together he had found the way he could express his own feelings and realizations. his inspiration he gain over from the pure of nature, humanity and Jesus Christ realizations .nature and humanity is the holy temples that motivated him during painting his paintings. by searching to understand the pure intent of the creator in his creatures i had starting studying impressions that we receive by viewing the creatures trying to reach and may show the hidden passionate meaning of them. it’s the passionate meaning that unite all beings in one living life, the Meaning of existence in every creature, assets and act. my passion is for impressionism & figurative art, i use all kinds of methods, oil on canvas, charcoal and pencil,pastels on canvas/paper, acrylic. i also had a collection of contemporary paintings spread in fate bene fratilli convents and hospitals. when i had blessed with his new baby boy he had an experience in the field of fascinating wall paintings for children. my wall paintings is hand painted which may give the painting a life sense. belief and creativity through giving and love which considered the guide lines of life, that’s why i give some of my art’s for free, and that’s why i had started NAZART movement which meant to enrichment and empower me by creating art not for a profit cause, by donating money from my art’s income for ngo’s. mediums: basically oil & charcoal combined with pencil, but he had also art works with pastels acrylic, glass, mixed media, inter active generative designs, photography, few sculptures with stone, bronze and wood. impressionism, tonalism, realism, abstract expressionism, contemporary.